After the previous day's long outing with significant route-finding challenges, I was looking for something a little less involved in the Red Rocks area west of Las Vegas. I found it in a series of smaller outings that I could bite off in increments - it would still be a pretty full day, but more straightforward and relaxed. 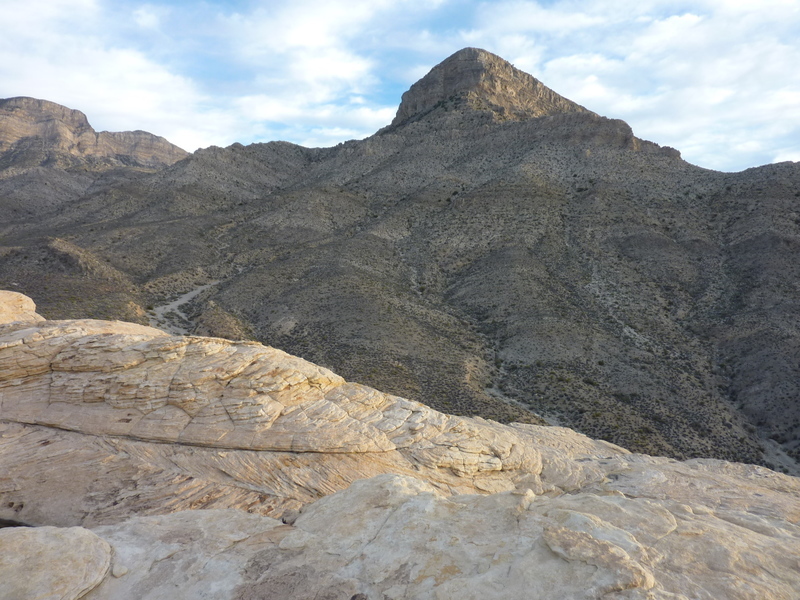 There are few maintained trails to actual summits in the Red Rocks area, with Turtlehead a notable and popular exception. Often derided by those familiar with the area (the 52 Peaks Club, for example), it was inevitable that I would have to visit it at some point and a Wednesday morning seemed as good a time as any. An early mid-week start would minimize the traffic I might encounter and in this I was not disappointed. I was up earlier than usual, getting myself to the Sandstone Quarry parking area on the Scenic Loop by 6:30a, shortly after sunrise. The primary massives of the sandstone bluffs to the west - Mt. Wilson, Rainbow Wall and Bridge Mtn were all brilliantly lit in the early morning light. I had only hiked about 10min along the trail when it occurred to me that I could add Tinaja Peak with a short diversion from the trail. I hadn't researched it ahead of time other than to know it was nearby and as it turned out, it wasn't really necessary. I guessed that a sandstone ramp on the west side would work out and was happy to find that it did. Some class 3 at the top of this ramp went steeply up to an adjacent block of sandstone which led to a ledge on the south side of the peak. More class 3 then when steeply up to the summit in short order, taking less than 15min from the trail. For a little bit of work, the peak provided some unexpected early morning fun, a fine view of Turtlehead to the north and a few placid tinajas that can be seen from the summit. I returned to the trail via the same route, then continued onto Turtlehead. Though Turtlehead presents an impressive facade on three sides, the trail makes good use of the far easier slope on the north side. It travels up through some rocky sections on the west side of the peak that have been defaced with paint marks that some fool thought might be useful to others. Sigh. Once on the north side, the trail seems to split in a dozen threads. Stay to the east for longer but easier hiking, start up sooner to get there quicker on steeper trails. A register box with a broken lid at the summit has been cemented into the rocks. Great. The box was filled with torn playing cards, tons of trash and lots of loose scraps with names scrawled on them, all exposed to the elements. I loaded all of this into my pack, leaving the box empty before I headed down. Registers on such summits simply make no sense (to me, anyway). I had the place and the views to myself for about 3-4min before another solo hiker with his dog came to the summit. The views are nice, as one might expect, particularly overlooking the Calico Hills to the southeast. I had descended most of the trail on the north side of the peak before realizing I had left my GPS back at the summit - rats - and back up I went, the other visitor easily guessing the reason for my second appearance. As I was returning to the TH just before 9a, a large hiking party complete with leader giving last minute instructions was ready to make an assault on the mountain. Popular indeed, this one is. This small collection of hills found 3mi west of Turtlehead includes a P1K, two summits on the 52 Peaks Club list, another found in Purcell's Rambles & Scrambles, and more from peakbagger.com. There are two trailheads on either end, the Willow Springs TH to the west and the one I used, the White Rock TH to the east. Purcell describes what sounds like an unpleasantly brushy ascent route up from the south to the saddle between the two main summits and another going up the SE Ridge of White Rock Springs Peak and then traversing to the higher P1K. I planned to use the latter option to start and then see what I might discover for a descent route to keep from coming back the same way. As with most of the Scenic Loop THs, the White Rock one is popular with lots of cars and people, even mid-week. The SE Ridge starts almost from the TH, so it takes but a minute to find one's solitude. The route is pretty much class 2-3 and not particularly interesting for Red Rocks, but the sandstone keeps it fun and after 50min I found my way to the first summit, White Rock Springs Peak (way too many words for a mountain name). The summit features an ammo box register, typical for those summits that appear on the 52 Peaks Club list. The club was started by Branch Whitney in 2011 (whom I'd met once before on Mt. Russell during the Sierra Challenge in 2002) and appears to be very popular. Even so, I still can't stand to find business cards in summit registers and I dutifully gathered up all the ones Branch had left and stuffed them in my pocket. At $10/mo for club dues, I don't doubt there will soon be another handful of cards in the register to entice new members. Much as I disdain that people are charged to hike, as a fan of capitalism I have to admit it's genious marketing. Getting off the summit is not as easy as continuing west along the ridge thanks to a rather formidable cliff on the summit's west and north sides. Luckily there is a break in the cliffs on the south side that with only a little backtracking can be followed down and then back along the ridge. Ducks appear to help lead one along the ridge towards White Rock Peak. Past the saddle between the two peaks the route begins to grow quite interesting. The route becomes a little convoluted and ducks appear to branch off in more than one direction. I found great class 3-4 scrambling by keeping close to the crest, even up an imposing section that looks improbable from a distance. It was just after noon by the time I reached the summit, a fine northern perch overlooking the Red Rocks area. Another ammo register looking much like the last one is found on the summit, similarly bereft of business cards after I left. I followed more ducks southeast off the summit leading to a minor sub-peak called Tunnel Vision Peak in Purcell's book. This was a fun 25min of class 3 scrambling to a point overlooking the basin below to the south. More tinajas and some geology as art added to the interest. Even on this more obscure summit, a busy register can be found, though it dates back further than the more popular ones. On my way between White Rock Peak and Tunnel Vision Peak, I had noted that some of the ducks branched south below White Rock Peak. Figuring that these led down a useable route not described in the guidebook, I decided to follow them. It was an excellent scrambling route, as it turned out, nicely cutting through heavy cliff areas down to a significant gully northeast of the Willow Springs TH. The brush had been nicely groomed in places obviating the need for bushwhacking. A huge chockstone in this gully caught me up short and I spent some time looking for an alternate way around it. Eventually I concluded that it must work, even though it looked impossible from above. I crawled through a small opening to find that some class 3-4 scrambling did indeed take one down through the chockstone to continue the route. I went through another interesting spot where the gully narrows considerably as well as other obstacles in what I deemed was the best scrambling of the day - great fun! Eventually I emerged from the gully and made my way to the Grand Circle Loop Trail that I could follow back to the TH where I'd started. I met a couple back at the TH who had set out on a hike much longer than they had planned, starting from the Willow Springs TH. They had intended to take the 2mi trail from one TH to the other on the front side (where I had returned to), but instead ended up going around the backside route almost twice that distance. I gave them a ride back to their car at the other TH before continuing on my way around the Scenic Loop. I got back to SR159 and made my way to the horseback riding TH on the SE side of the highway. Blue Diamond Hill, a prominent landmark viewed from Las Vegas, is a P1K and a pretty casual hiking destination. Several trails wind their way to the highpoint with the stables route probably the shortest at 3mi one-way. A weak storm was making its way over the area from the west and it looked like it might be only an hour or so before some rain started to fall. Time to hustle. I followed a trail east from the stables before turning south to start climbing onto one of the subisidiary ridgelines that rise to form Blue Diamond Hill. The trail I followed is an active mountainbike route, in places quite challenging with drops exceeding 18". Higher up the trail forks in various directions (the one I followed was called " Boneshaker"), but it's not hard to figure out which way leads to the highpoint. I passed by some telecom equipment about 1/3mi before the summit (at first thinking it would be the highpoint).